Writing with profound psychological and spiritual insight, prize-winning author Gary Zukav has had a major impact on the consciousness of millions. In his "New York Times" number-one bestseller, "The Seat of the Soul, " he explained how the expansion of human perception beyond the five senses leads to a new understanding of power -- the alignment of the personality with the soul -- which in turn leads to an awareness of our extraordinary creative abilities. 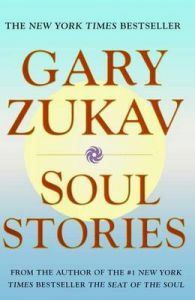 Now, in one of the most important and useful books you will ever read, "Soul Stories, " Zukav shows how this new understanding of power -- authentic power -- transforms lives in countless ways. Soul Stories is filled with marvelous stories that show how concepts such as intuition, harmony, cooperation, sharing, and reverence for life actually express themselves in people's lives. Best of all, the stories lead to practical advice on how you can discover your own Soul Stories and the truths they reveal about the deepest sources of your being. Wonderfully readable, "Soul Stories" is a wise and inspirational book.